When you use shipping container buildings, you may want entrance options that go beyond standard doorways. Personnel doors can provide a secure way for personnel to enter and exit the building, while roll-up doors can be a great choice if you often bring large equipment into your storage container. In larger containers, having two entrances can be useful because they make it easier to access items in all parts of the container. Extra doors are one of the most popular modification options for storage containers. Personnel doors are easy to operate, making them a great choice for portable office buildings. Personnel doors allow sanctioned employees to walk in and out of your portable office. At the same time, they are quite secure. Incorporating a personnel door will not compromise the security of your portable buildings; important papers and expensive items will stay safe. Doors can be a weak spot in terms of insulation, but Falcon Structures’ personnel doors can keep your storage container well insulated. Personnel doors are carefully installed to ensure that the container remains wind and water-resistant. The insulated core works to keep containers cool in the summer and warm in the winter. Roll-up doors are useful if you store large equipment in your storage box, especially if you need to access it frequently. Roll-up doors come in a variety of widths. Another option is extreme-duty, wind-rated roll-up doors for special needs or environments. Roll-up doors are more often used with equipment storage rather than in containers that are being used as offices or living quarters. 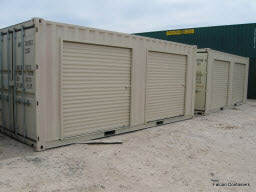 Both roll-up and personnel doors can be installed on opposite ends of the storage container, depending on your needs. On bigger containers, you might choose to install a combination of entryways. The design of any shipping container building should be fitted to your needs. While shipping container buildings are most renowned for their affordability and mobility, there is no reason for companies to struggle with inefficient entrances to these containers. Whether you need to make it more convenient for other people to enter the building, or easier to move things in and out of the building, there is a door that can help. To learn more about shipping container office buildings, give us a call at 877-704-0177.